Next gig: Villain & Saint, January 21, Bethesda, Md. Please join me for my next performance on Sunday, January 21, 4 to 6 p.m., at Villain & Saint, 7141 Wisconsin Ave., Bethesda, Md. With me will an all-star group: pianist Harry Appelman, Percy White on bass, George Oakley on reeds and flute, and Jack Kilby on drums. I hope you can join me on Sunday, August 13, 4 to 6 p.m. at Villain & Saint, 7141 Wisconsin Ave., Bethesda, Md., where I’ll be singing with pianist Jim Levy, bassist Percy White and drummer Ele Rubenstein on drums. It’s my second time at Villain & Saint, which describes itself as “a Haight-Ashbury-inspired rock ‘n’ roll music hall,” which obviously has room for the eclectic mix of standard and not-so-standard jazz tunes we’ll be playing. The Villain & Saint kitchen offers “classic bar-fare of hamburgers, loaded nachos, chicken wings and quesadillas and “a standout selection of premium whiskies and bourbons, American beers, and a slew of signature cocktails.” Perfect for a Sunday afternoon in August, and a great place for music. I hope you can join us on August 13. I’m thankful to Jamekaa Flowers for taking photos at my April 2 show at Villain & Saint in Bethesda with Harry Appelman (piano), Percy White (bass) and George Oakley (reeds and woodwinds). Here, below are a few shots. If you’re interested, there’s more in the gallery section of this website. 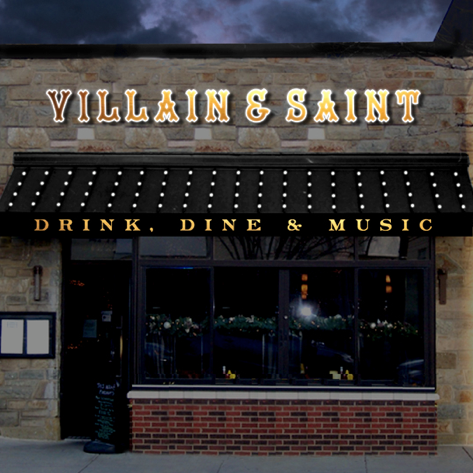 Next Gig: Villain & Saint, Bethesda, Sunday, April 2, 4 to 6 p.m. But wait! That’s not all! There are three even bigger reasons you should come: the acclaimed Harry Appelman, on piano; the spectacular Percy White on upright and electric bass; and the magical George Oakley on reeds and flute. Really, these guys are so great that I will have to be careful not to forget to sing as I watch them in awe. If that’s not enough to get you there, consider Villain & Saint, which describes itself as “a Haight-Ashbury-inspired rock ‘n’ roll music hall,” which obviously has room for the eclectic mix of standard and not-so-standard jazz tunes we’ll be playing. The Villain & Saint kitchen offers “classic bar-fare of hamburgers, loaded nachos, chicken wings and quesadillas and “a standout selection of premium whiskies and bourbons, American beers, and a slew of signature cocktails.” Perfect for a Sunday afternoon in April. For all those reasons and more, I hope to see you at Villain & Saint on April 2. 1) Square in the Circle (pictured above) is actually the home of my good friend Alan Kanner, who regularly hosts some of the best independent musicians from across the U.S. It’s a relaxing, intimate setting where the audience can actually touch performers there, but let’s not get carried away with that. 2) Because Square in the Circle typically hosts folk and roots musicians, I’m excited to mix my usual jazz set with equal parts folk, country and blues tunes. It’ll be a night of great American music by the likes of Rodgers & Hammerstein, Elvis Costello (okay, British, but with the heart of an American), Billy Strayhorn, Bob Dylan, Duke Ellington and Tom Waits. 3) I’ll be joined again by two spectacular musicians, who, without me, would be worth your hearing: on piano, Dan Lamaestra, who has recorded extensively and performed around the world and currently holds the prestigious position of pianist with the internationally renowned Navy Commodores Jazz Ensemble; and, on bass, David Jernigan, one of the Washington area’s leading (and busiest) performers of Brazilian and American jazz. All this for the low, low cover charge of only $10 per person. There will be refreshments there, but you’re welcome to bring your own, if you don’t mind contributing. Because it’s a house, seating is limited. So if you plan to attend, please send an email to me at weintraubjeff@gmail. If I were to tell that this will be a fun night of great song and spirit, is that something you might be interested in? See you on February 11. Since I announced to you last week that I’ll be singing on Wed., Sept. 14, at Twins Jazz Club, in Washington, D.C., I got called for another gig on Thurs., Sept. 8, at the Ritz-Carlton, Georgetown. The program on Sept. 8 is produced by Art Soiree, which puts on a wide range of innovative music and arts programs around the D.C. area. Held outside in the hotel’s intimate Urban Garden, this should be a lot of fun. With me for both programs will be two spectacular musicians: Dan Lamaestra on piano and David Jernigan on bass. We’ll be playing an eclectic mix of standard and not-so-standard jazz tunes. For a hint of what you’ll hear, click here to listen to my recordings. At Twins, located at 1344 U Street (top floor), NW, Washington, D.C., there’s a cover charge of merely $10 and a food or drink minimum of $10. Doors open at 7 p.m. The music starts at 8 p.m. for the first set. The second set starts at 10 p.m. For directions and parking tips, click here. On Sept. 8, the Urban Garden bar opens at 6 p.m. The music will play from 7 to 9 p.m. The Ritz-Carlton, Georgetown, is located at 3100 South Street, N.W. Washington, D.C.